activities for children aged 3-12 focusing on the importance of pollinators and their habitats, ultimately resulting in a new pollinator-friendly garden adjacent to the library. 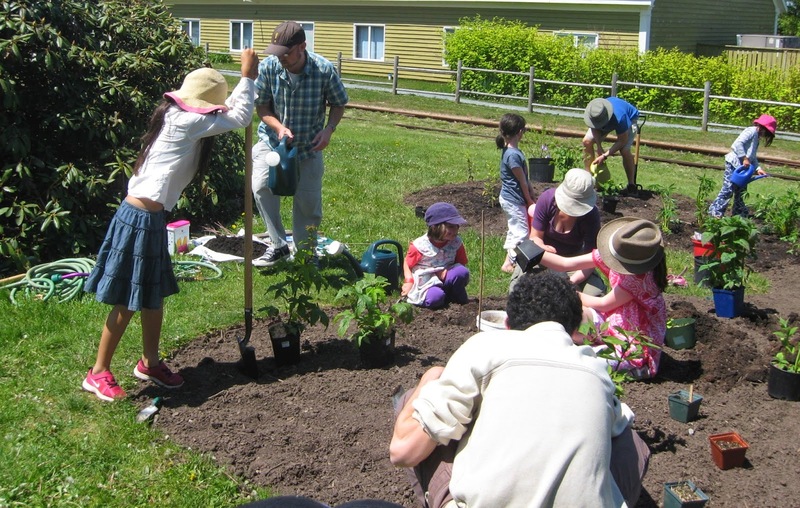 Beginning with a garden design workshop and planting session in May, the community created a pollinator-friendly garden featuring Meadowsweet, Climbing Honeysuckle, and Hyssop. 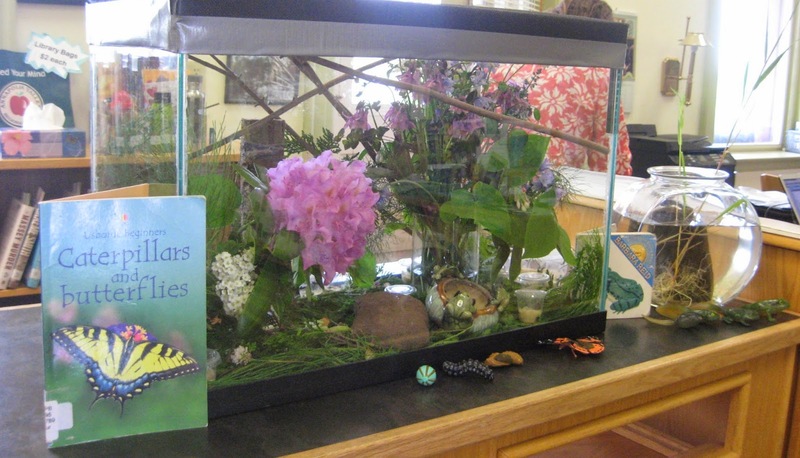 Though our room for displays is small, we made use of the counter space and butterflies were raised from caterpillars to Painted Ladies at the check-out desk and released outside. 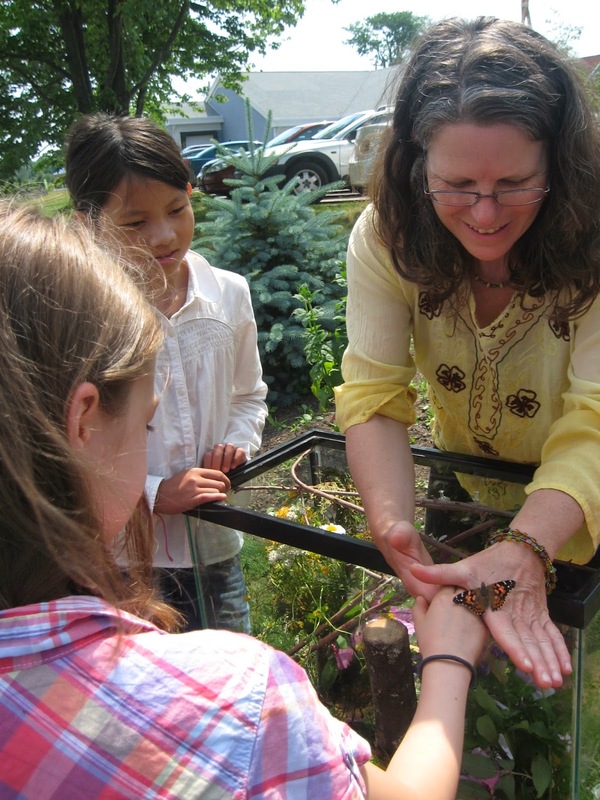 The weekly art drop-in sessions for children aged 7-12 have focused on bees and butterflies. We had an overwhelming response to the program and local kids happily created “stained glass” butterfly art, drew close-ups of flowers and created a honeycomb art mural. We hosted Perry Brandt, a local bee-keeper, for a presentation about the necessity of bee pollination and protection of our bees. He also brought along a demonstration beehive to display. Held outside, on the covered back patio of the library, this event was open to all ages and we had 63 in attendance, even with rain showers! one more Drop-In Art Session on Thursday, July 31 and in August the Library Art Gallery will feature Bee related art. (TD FEF) is a national charity that funds environmental projects across Canada. With the support of more than 140,000 donors, TD FEF has provided more than $66 million to over 22,000 environmental projects and programs. I’ll admit it – one of the things that scares me most is the concept of Readers’ Advisory. My heart starts racing, my palms get sweaty! For a few seconds, I immediately feel like the librarian who has lost her way. How are we supposed to know about every genre, author and topic in the library? It’s impossible. Then I pull myself back into reality knowing that even librarians who are voracious readers know that they can’t read everything. Readers’ Advisory is a critical personal library service. Our patrons come in for our friendly and helpful service. They want to get in and out with something to read. When they find just the right book and have a wonderful reading experience, they want to visit the library more often. Our best marketing tool is a satisfied customer who spreads the word about the wonderful service that he/she received at the library. We try to be welcoming and helpful so that our readers leave our libraries with what they came in for, and often more. Approachability is the key. Except during the crazily busy times, we can make sure that patrons understand that we have the time to talk about books and reading with them for a few minutes. We want them to feel comfortable coming to us for help. Sometimes, people are lonely and like to talk about lots of different things, so we try to be respectful but not stray off topic for very long. That said, some older adults crave kindness and human contact and the library may be one of the few places they encounter these on a regular basis. We look at this as a customer need and understand that we may have to spend more time working with older adults to help them find what they need. This isn’t always possible when working alone or during very busy periods but we should always be aware of its place in the customer service skill set. One reason older adults are often so appreciative when receiving good or excellent customer service is that in today’s fast-paced world, service staff can be impatient with anyone who needs extra attention. It’s important for librarians working with seniors to remember that becoming an older adult can be a challenging and stressful time. Apart from the pre-school crowd, no other group is as openly appreciative when they receive the help they need. They are also quite likely to point out how young we are on a satisfyingly regular basis! When people don’t want to search our shelves because they’re in a hurry or because they simply don’t know what they want, they come to us for help. We are the human version of a search engine and we’re supposed to magically produce the perfect books for them in a matter of minutes. And do you know what? We do just that every single day that we work! Then the question: “Can you help me find something to read?” can be a welcome one! Get in touch with your wild side at Oaklawn Farm Zoo. Located just outside Aylesford in the beautiful Annapolis Valley, Oaklawn Farm provides a visitors an up-close view with over a 100 species of animals. Summer is always a busy time at the Zoo. Many new babies have been born, including goats, llamas, monkeys, sheep, and the list goes on. Most recent additions at the zoo include a group of Lion-tailed Macaques that arrived in May and three Cheetahs that arrived in June. 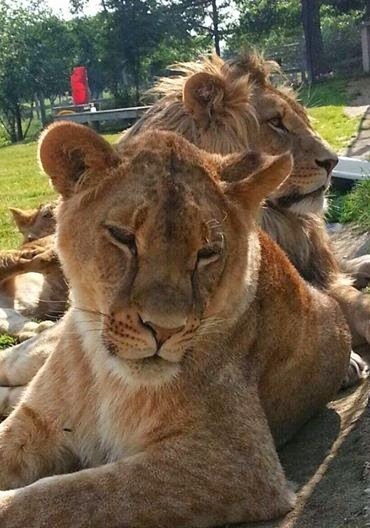 The young lion pride of Sterk , Nyah and Obi are a huge favourite to many visitors, as well as the gibbon family of BooBoo, Zandor and their little ones. Come out and discover your favourite creature today! This summer, the library has partnered with Oaklawn Farm Zoo to offer a great opportunity-- everyone 18 and under who shows their AVRL library card on July 15 and August 12 gets in FREE! So make sure you have your card in hand, and join us. In addition to the amazing animals, we will be doing storytimes, art, and math games. You can also take a StoryWalk while you are at the zoo! Come find us on July 15 or August 12 from 10 AM - 4 PM, by the deer pen. You can also mark off some activities on your STREAM card. See you at the zoo! The Nemours Foundation has some of the most comprehensive, family-friendly health information that you’ll see. Their KidsHealth.org website has one of the highest rankings in the world on this subject. I have chosen some sites from this organization to help you keep everyone safe and healthy on summer vacation this year. *Thinking about camping or hiking in the woods ? Read THIS. *Going for a swim? Read this first. *How about a plane trip or travel to another country? Here’s info for you! And speaking of vacations, if you are planning to stay close to home this year the Nova Scotia Tourism publishes the Doers and Dreamers Travel Guide, the Campers Guide and the Park Events Guide. Get your copy online or call 1-800-565-0000. Thinking farther afield? We can help there too, check out our travel books at your local library and make plans. And don’t forget to sign up for the Summer STREAM, and try some of THESE great activities. 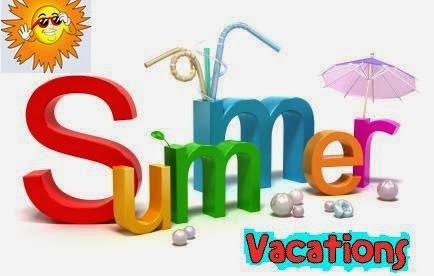 Have a fun and safe summer!